For dates of training courses currently scheduled for 2019 (more dates to follow) please click here. This two-day course provides introductory training in the approach of Video Interaction Guidance ukTM for professionals who work with parents and carers who are experiencing difficulties in communication with their children and wish to develop better relationships with them. VIG is also relevant to staff who work with children and young people in special education or care settings and for staff in higher education who support others in teaching and supervision skills. The two-day training course will provide an introduction to what Video Interaction Guidance ukTM is and its theoretical origins. It will also offer illustrations of clips used by guiders with clients and an introduction to the framework for micro-analysis of attuned and non-attuned interaction based on the work of developmental psychologist Colwyn Trevarthen. The ratio of trainers to participants will be roughly 1:4 (max 5), to allow close support to the small group skills-based practice sessions that participants will engage in on both days. At the end of the two days participants will understand how and why VIG works, will be able to describe the principles of attuned communication. Participants will also be able to take their new awareness of initiatives and reception and other principles of attuned interactions into their professional observations of parent-child or teacher-student communication. Having seen themselves on video and experienced supportive feedback about their communication style from peers, participants will also be able to describe their own strengths in communication with clients and identify for themselves a working point or goal for change in communication. Participants will also have practice in using a camcorder and downloading video on to a laptop or working with an IPad. This two-day course for professionals provides a structured and systematic, evidence-based, approach with a detailed step-by-step processes for assessment, case analysis and intervention. It is offered to support people in using the EPaS practitioner guide recently published by Routledge. The assessment, case analysis and intervention strategies are based on a programme, initially developed by Professor Hutchings over twenty years ago, for parents of children, aged between three and ten, who have been referred to a Child and Adolescent Mental Health Service (CAMHS). The training is suitable for CAMHS based, social work, mental health nursing, health visitors or other staff that work with families of children aged between three and ten. It is also suitable for professionals involved in training and supporting staff that are working on a one-to–one basis undertaking therapeutic work with families of challenging children within the same age range. 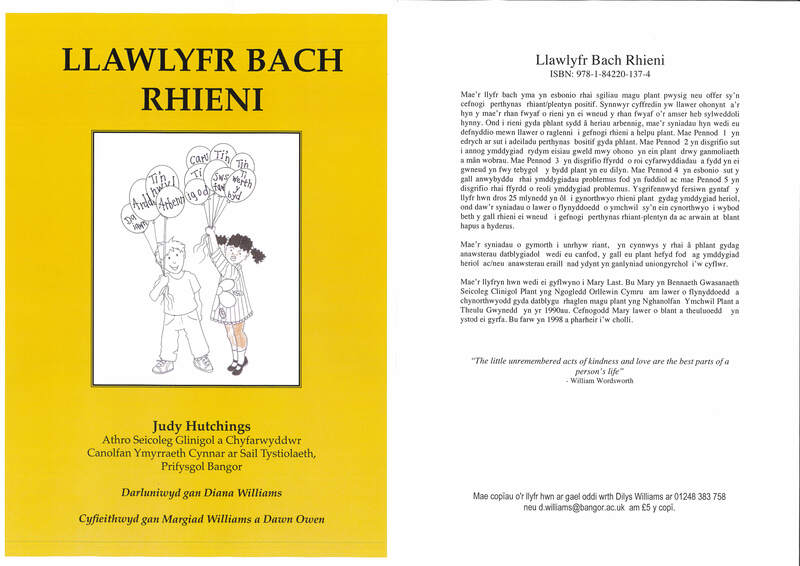 The training includes all resources needed to deliver the programme including a copy of the EPaS manual (provided in advance of the training), a copy of the Little Parent Handbook (which is also available in Welsh) and additional handouts and resources for parents. This workshop is for service managers working in CAMHS, managers in early preventive services, parenting co-ordinators responsible for the implementation of local parenting plans, line managers responsible for staff delivering programmes and education based staff involved in promoting effective teacher classroom management strategies and social and emotional curricula in the early school years. Whilst the presentation will include lessons learned specifically from delivering the IY programmes, the day should also be of wider relevance in terms of the broader responsibilities of managers in health, social care, education and voluntary sector settings. The workshop gives an overview of the IY programmes, describing recent developments and providing an update on research in Wales. It then focuses on the strategic issues facing service managers in developing local strategies, with opportunities to discuss resources needed for effective delivery of programmes and how to develop a tiered model (including universal, targeted preventive initiatives and services for referred families with high-risk children). There will be a session on implementation fidelity (how to ensure that programmes are being delivered effectively) that discusses the importance of supervision and the IY leader accreditation and mentoring processes. Places will be limited to ensure that all participants get an opportunity to receive feedback during the course of the day. Places allocated in strict order of booking. Separate workshops on evaluation issues are also funded by the Welsh Government for people in Wales and led by Dr Tracey Bywater. People managing projects are increasingly being asked to “do an evaluation” of that project. Many people are not sure what evaluation tools to use or how to analyse quantitative data. This introductory one-day workshop will help give delegates more confidence in these areas. This course is suitable for anyone interested in learning more about evaluation and is particularly applicable to staff managing or delivering services for parents and wanting to evaluate parenting programmes. This comprises two four-day courses for researchers, teachers and educationalists. The full programme will provide training in two observation-coding systems that have been used extensively to evaluate the effectiveness of the IY programmes both internationally and in Wales. The first four-days will be dedicated to training attendees in the Dyadic Parent-Child Interaction Coding System - Revised (DPICS-R). After training to use all 37 parent-child categories, subsequent inter-observer reliability sessions will be held. Between the first and second sessions of training we ask attendees to use the DPICS-R as often as possible in order to acquaint themselves fully with the coding system and to ensure that high levels of reliability are being attained. The second four-day training will have two components. The first two-days will be spent checking that attendees are achieving acceptable levels of inter-observer reliability and are confident, and competent in using the DPICS-R system. During the final two days we will train attendees to be competent and reliable in using the T-POT classroom coding system. The T-POT was developed and validated by Dr. Pam Martin and makes use of many of the DPICS categories but also includes codes of direct relevance to the classroom situation. It will be possible for people to enrol for the full eight days covering both DPICS and T-POT, or the six days of DPICS training. People who have previously trained in the DPICS may attend the second four-day training that includes two days of reliability training in the DPICS and the two-day T-POT training. Cost for each four-day course: £500 (excluding VAT).